The Spurs suddenly look very old and un-athletic....getting beat for the 3rd straight game by a young and on the rise team. 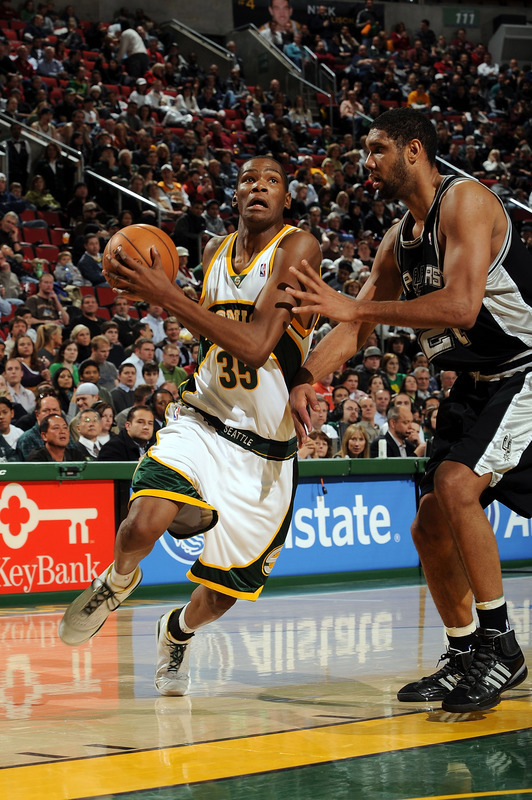 Durant snapped off 26 on the the Spurs and also hit the game winning shot with 32 ticks left. Is it to early to say that this team may be washed up or is the playoff push just right around the corner? Well, it just got a little tougher with T. Parker-Longoria our indefinitely with a sore heel because of bone spurs! Twins fans, say goodbye to the best pitcher in the AL the last few years....he is moving to New York. The Mets literally gave up the farm to get Santana (top prospects 2,3,4,&7). Was it worth it Mets fans? Just think if you had Santana during the monumental collapse last year....would the collapse even have happened? Even if it did...I like my chances pitching Santana in that last game of the season when the Mets were playing for a playoff berth. Now ask yourself....was it worth it? - and finally.....is just flat out better than you! It just doesn't make any sense. Nothing positive can come of it. You just pissed off the Patriots even more. Expect a size 12 pair of spikes in your back an an extra twist of that ankle if the Patriots get a chance. If I was your team mate I would beeotch slap you my self! 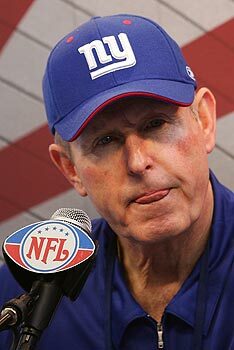 Coughlin's expression when he heard what Plax said..........Classic! 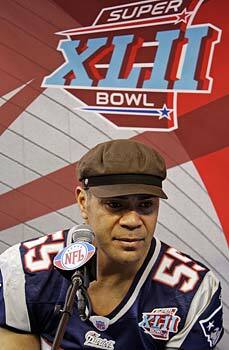 Seau...I know your a Hall of Famer but that doesn't mean you get a fashion pass........You look like a Taxi driver or a locomotive engineer in this photo son! 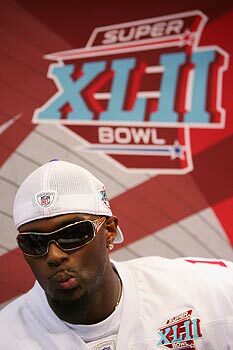 First off....who Knew Anthony Wright was the Giants backup? I didn't! Anyway......i thought this photo was funny because of what T Wright's eyes are fixed on! Lastly....am I the only one that thinks it silly that the players walk around on media day with football pants and jersey's on? Why not regular clothes? Just my opinion guys! Talk to you guys tomorrow. By the way.....stay tuned for the divisional breakdowns, I haven't forgot about them......just saving it for one of the light days. Check back in tomorrow. This page contains a single article from January 30, 2008 10:24 AM. The previous days article was Greggy G's Free ATS Picks & Friendly Faces. The next days article was Home of Greg Gamble's Free ATS Picks.